İnsanın, diğer canlılardan farklı olarak kendi bilincinin ve müstakbel ölümünün farkında ve bu farkındalıkla başa çıkabilmek bir sistem geliştirme ihtiyacında olduğu düşüncesinden yola çıkarak ortaya konan Terör Yönetimi Kuramı, insanın ölüm gerçeğinden kaçmak için geliştirdiği mekanizmalara ışık tutmayı amaçlamaktadır. Terör Yönetimi Kuramı’na göre kültür, gerçek ya da sembolik anlamda bir ölümsüzlük vaadiyle ölüm karşısında bir kaygı tamponu görevi görmektedir. Çocuklukta ebeveyn ilgisi ve sevgisinin sağladığı koruma ve güvenlik hissi zamanla dünya görüşünde aranır; tıpkı anne-babanın sevgisini kazanmak için onların istediği şekilde davranan bir çocuk gibi, bir yetişkin de dünya görüşüne uygun davranarak güvenlik duygusunu elde eder. Bu noktada benlik saygısı devreye girmektedir; benlik saygısı yüksek olan bireyler dünya görüşleriyle uyum içerisinde olduklarını daha fazla hissetmekte ve ölümleri belirginleştirildiğinde daha az kaygı hissetmektedirler. Yakın zamanda yapılan çalışmalar, bu durumu bağlanma tarzlarıyla ilişkilendirmektedir. Erken çocukluk döneminde çevre ve bakıcıyla olan ilişkiler, benlik saygısı üzerinde belirleyici olabilmektedir. Bu çalışmada, Terör Yönetimi Kuramı çerçevesinde sözü edilen bu görüşleri incelemek üzere yapılan çalışmaların derlenmesi ve bulgularının klinik anlamda ne tür faydalar sağlayabileceğinin tartışılması amaçlanmaktadır. Built upon the idea that human beings, as the only species whose members are aware of their own consciousness and future death, have to come up with a system to deal with this awareness, Terror Management theory aims to shed light on the mechanisms that human beings have developed in order to avoid the cold fact of death. According to Terror Management Theory, culture serves as an anxiety buffer against death by offering either a literal or symbolic immortality. The sense of protection and safety provided by the parental care in childhood is sought in the worldview in adulthood; just like a child acting in a way to please her/his parents to maintain their affection and care, an adult attains the sense of safety by acting in compliance to her/his worldview. At this point, self-esteem comes into the equation; individuals with high self-esteem experience more sense of compliance with their worldview than those with low self-esteem, and they feel less anxiety when their mortality is reminded to them. Recent research links these with attachment styles. Relationships with the environment and the primary caregiver in early childhood can be determinative on self-esteem. In this study, it is aimed to review the ideas presented here and developed within the framework of Terror Management Theory, and to discuss the benefits that can be drawn from their findings, especially in regards to clinical applications. Arndt J, Greenberg J, Solomon S, Pyszczynski T, Simon L (1997) Suppression, accessibility of death-related thoughts, and cultural worldview defense: exploring the psychodynamics of terror management. J Pers Soc Psychol, 73:5–18. Arndt J, Lieberman JD, Cook A, Solomon S (2005) Terror management in the courtroom: exploring the effects of mortality salience on legal decision making. Psychol Public Policy Law, 11:407-438. Arrowood RB, Cox CR, Ekos NV (2017) Mortality salience increases death-thought accessibility and worldview defense among high Broad Autism Phenotype (BAP) individuals. Pers Individ Dif, 113:88-95. Becker E (1973) The Denial of Death. New York, Free Press Paperbacks. Bowlby J (1985) Attachment and Loss: Vol. 3, Loss. Great Britain, Pelican Books. Bowlby J (1989) Attachment and Loss: Vol. 1, Attachment. Great Britain, Pelican Books. Brassai L, Piko BF, Steger MF (2012) Existential attitudes and Eastern European adolescents’ problem and health behaviors: highlighting the role of the search for meaning in life. Psychol Rec, 62:719-734. Brown JD, Dutton KA, Cook KE (2001) From the top down: Self-esteem and self-evaluation. Cogn Emot, 15:615–631. Chatard A, Selimbegovic L, Konan PN, Arndt J, Pyszczynski T, Lorenzi-Cioldi F, Van der Linden M (2007) Terror management in times of war: mortality salience effects on self-esteem and governmental support. J Peace Res, 48:225-234. Chung JM, Hutteman R, van Aken MAG, Denissen JJA (2017) High, low, and in between: self-esteem development from middle childhood to young adulthood. J. Res Pers, 70:122-133. Cole DA, Maxwell ES, Martin JM, Peeke LG, Seroczynski AD, Tram JM et al. (2001) The development of multiple domains of child and adolescent self-concept: a cohort sequential longitudinal design. Child Dev, 72:1723-1746. Cox CR, Arndt J, Pyszczynski T, Greenberg J, Abdollahi A, Solomon S (2008) Terror management and adults’ attachment to their parents: the safe haven remains. J Pers Soc Psychol, 94:696–717. Donnellan MB, Kenny DA, Trzesniewski KH, Lucas RE, Conger RD (2012) Using trait-state models to evaluate the longitudinal consistency of global self-esteem from adolescence to adulthood. J Res Pers, 46:634-645. Du H, Jonas E, Klackl J, Agroskin D, Hui EKP, Ma L (2013) Cultural influences on terror management: independent and interdependent self-esteem as anxiety buffers. J Exp Soc Psychol, 49:1002-1011. Du H, Jonas E (2015) Being modest makes you feel bad: effects of the modesty norm and mortality salience on self-esteem in a collectivistic culture. Pers Soc Psychol Bull, 56:86-98. Florian V, Mikulincer M (1998) Symbolic immortality and the management of the terror of death: the moderating role of attachment style. J Pers Soc Psychol, 74:725-734. Frankl, (2015) İnsanın Anlam Arayışı (Çeviri S Budak). İstanbul, Okuyan Us. Greenberg J, Solomon SF, Pyszczynski T (1997) Terror management theory of self-esteem and social behavior: empirical assessments and conceptual refinements. Adv Exp Soc Psychol, 29:61-139. Greenberg J, Solomon SF, Pyszczynski T, Rosenblatt A, Burling J, Lyon D et al. (1992) Why do people need self-esteem? Converging evidence that self-esteem serves an anxiety-buffering function. J Pers Soc Psychol, 63:913-922. Greenberg J, Pyszczynski T, Solomon S (1986) The causes and consequences of a need for self-esteem: a terror management theory. Public Self and Private Self (Ed RF Baumeister):189-212. New York, Springer-Verlag. Harmon-Jones E, Simon L, Pyszczynski T, Solomon S, McGregor H (1997) Terror management theory and self-esteem: Evidence that increased self-esteem reduces mortality salience effects. J Pers Soc Psychol, 72:24–36. Harmon-Jones E, Greenberg J, Solomon S, Simon L (1996) The effects of mortality salience on intergroup bias between minimal groups. Eur J Soc Psychol, 26:677-681. Hart J, Shaver PR, Goldenberg JL (2005) Attachment, self-esteem, worldviews, and terror management: evidence for a tripartite security system. J Pers Soc Psychol, 88:999-1013. Hayes J, Schimel J, Arndt J, Faucher EH (2010) A theoretical and empirical review of the death-thought accessibility concept in terror management research. Psychol Bull, 136:699-739. Hirschberger G, Florian V, Mikulincer M (2003) Strivings for romantic intimacy following partner complaint or criticism: a terror management perspective. J Soc Pers Relat, 20:675-687. Josephs RA, Bosson JK, Jacobs CG (2003) Self-esteem maintenance processes: why low self-esteem may be resistant to change. Pers Soc Psychol Bull, 29:920-933. Kastenbaum R (2000) The psychology of death, 3rd ed. New York. Springer Publishing Company. Kuster F, Orth U, Meier LL (2013) High self-esteem prospectively predicts better work conditions and outcomes. Soc Psychol and Personal Sci, 4:668-675. Landau M, Greenberg J (2006) Play it safe or go for the gold? A terror management perspective on self-enhancement and self-protective motives in risky decision making. Pers Soc Psychol Bull, 32:1633-1645. Landau M, Greenberg J, Sullivan D (2009) Managing terror when self-worth and worldview collides: Evidence that mortality salience increases reluctance to self-enhance beyond authorities. J Exp Soc Psychol, 45:68-79. Leary MR (2004) The function of self-esteem in terror management theory and sociometer theory: comment on Pyszczynski et al. (2004). Psychol Bull, 130:478–482. Leary MR, Tambor ES, Terdal SK, Downs DL (1995) Self-esteem as an interpersonal monitor: the sociometer hypothesis. J Pers Soc Psychol, 68:518-530. McGregor I, Gailliot MT, Vasquez NA, Nash KA (2007) Ideological and personal zeal reactions to threat among people with high self-esteem: motivated promotion focus. Pers Soc Psychol Bull, 33:1587-1599. Mikulincer M, Florian V (2000) Exploring individual differences in reactions to mortality salience: does attachment style regulate terror management mechanisms? J Pers Soc Psychol, 79:260-273. Mikulincer M, Florian V, Hirschberger G (2003) The existential function of close relationships: introducing death into the science of love. Pers Soc Psychol Rev, 7:20-40. Mikulincer M, Florian V, Tolmacz R (1990) Attachment styles and fear of personal death: a case study of affect regulation. J Pers Soc Psychol, 58:273-280. Mikulincer M, Florian V, Birnbaum G, Malishkevich S (2002) The death-anxiety buffering function of close relationships: exploring the effects of separation reminders on death-thought accessibility. Pers Soc Psychol Bull, 28:287-299. Orth U, Robins RW (2014) The development of self-esteem. Curr Dir Psychol Sci, 23:381-387. Orth U (2018) The family environment in early childhood has a long-term effect on self-esteem: a longitudinal study from birth to age 27 years. J Pers Soc Psychol, 114:637-655. Orth U, Robins RW, Roberts BW (2008) Low self-esteem prospectively predicts depression in adolescence and young adulthood. J Pers Soc Psychol, 95:695-708. Pyszczynski T (2004) What are we so afraid of? A terror management theory perspective on the politics of fear. Soc Res, 71:827-848. Pyszczynski T, Greenberg J, Solomon S, Arndt J, Schimel J (2004) Why do people need self-esteem? A theoretical and empirical review. Psychol Bull, 130:435–468. Routledge C, Juhl J (2010) When death thoughts lead to death fears: mortality salience increases death anxiety for individuals who lack meaning in life. Cogn Emot, 24:848-854. Salisbury L C, Nenkov GY (2016) Solving the annuity puzzle: the role of mortality salience in retirement savings decumulation decisions. J Consum Psychol, 26:417-425. Schimel J, Hayes J, Williams T, Jahrig J (2007) Is death really the worm at the core? Converging evidence that worldview threat increases death-thought accessibility. J Pers Soc Psychol, 92:789-803. Schmeichel BJ, Gailliot MT, Filardo E, McGregor I, Gitter S, Baumeister RF (2009) Terror management theory and self-esteem revisited: the roles of implicit and explicit self-esteem in mortality salience effects. J Pers Soc Psychol, 96:1077–1087. Simon L, Arndt J, Greenberg J, Pyszczynski T, Solomon S (1998) Terror management and meaning: evidence that the opportunity to defend the worldview in response to mortality salience increases the meaningfulness of life in the mildly depressed. J Pers, 66:359-382. Steger MF, Fitch-Martin AR, Donnelly J, Rickard KM (2015) Meaning in life and health: proactive health orientation links meaning in life to health variables among American undergraduates. J Happiness Stud, 16:583-397. Steger MF, Kashdan TB, Sullivan BA, Lorentz D (2008) Understanding the search for meaning in life: personality, cognitive style, and the dynamic between seeking and experiencing meaning. J Pers, 76:199-228. Strachman A, Schimel J (2006) Terror management and close relationships: evidence that mortality salience reduces commitment among partners with different worldviews. J Soc Pers Relat, 23:965-978. Taubman Ben-Ari O (2011) Is the meaning of life also the meaning of death? A terror management perspective reply. J Happiness Stud, 12:385–399. Taubman Ben-Ari O, Findler L, Mikulincer M (2002) The effects of mortality salience on relationship strivings and beliefs: The moderating role of attachment style. Br J Soc Psychol, 41:419–441. Van Tongeren DR, Green JD, Davis DE, Worthington EL, Reid CA (2013) Till death do us part: terror management and forgiveness in close relationships. Pers Relat, 20:755-768. Vance LM (2014) Death anxiety and the relational. J Humanist Psychol, 54:414-433. Verschueren K, Marcoen A (1999) Representation of self and socioemotional competence in kindergartners: differential and combined effects of attachment to mother and to father. Child Dev, 70:183-201. Wojtkowiak J, Rutjens BT (2011) The postself and terror management theory: reflecting on after death identity buffers existential threat. Int J Psychol Relig, 21:137-144. 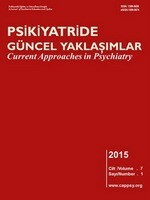 Yalom ID (2001) Varoluşçu Psikoterapi (Çeviri Zİ Babayiğit). İstanbul, Kabalcı Yayınevi. Yek MH, Olendzki N, Kekecs Z, Patterson V, Elkins G (2017) Presence of meaning in life and search for meaning in life and relationship to heath anxiety. Psychol Rep, 120:383-390.